Hawaii elections are peculiar times in the islands for a variety of reasons. With a population of about a million and a half, the state’s electorate is tiny on the national scale. Voters here tend to focus on local issues and races, as do the politicians that run the state. Hawaii voters took a particular pride that Barack Obama, a child of Hawaii, was a viable candidate for president in 2008. His re-election in 2012 was momentous for a new generation of aspiring politicians. Hawaii’s electoral votes were inconsequential in both elections. It is an electorate that long ago resigned itself to the fact that we have virtually zero political currency nationally. Other small states like Connecticut or Delaware are home to industries like banking and manufacturing, so they have considerably more political clout through powerful lobbies. The main industries in Hawaii are tourism and the military. Both are relatively self-contained in Hawaii. Hawaii is also a decidedly and irretrievably “blue” state, with the Democratic party being the political hegemony since statehood in 1959. There are no Republicans in the state senate. The GOP’s representation in the House of Representatives is minimal. 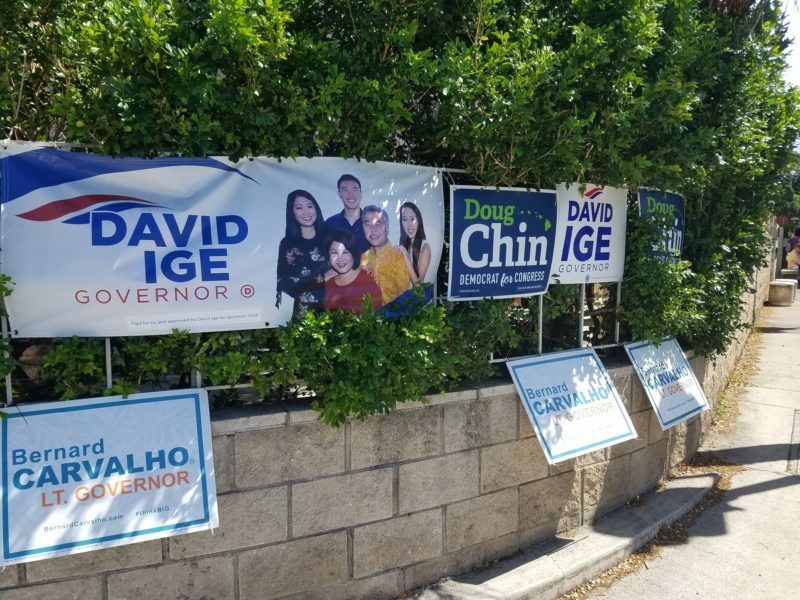 Multiple campaigns signs on a resident's wall. Republican Linda Lingle held the governorship from 2002-2010, elected by a population that was dissatisfied with the status quo maintained by the previous Democratic administration of Ben Cayetano. Lingle was pro-choice, unlike mainstream, hardline Republicans nationally. Following her time as governor, Lingle lost her bid for the US Senate in 2012. Presumably, Hawaii voters did not want a Republican representing them in the august chamber of the Senate, even if they were willing to have her lead the state at home. Name recognition plays big in Hawaii politics, as does seniority. US Senator Dan Inouye served just shy of 50 years, the second longest term in the history of the Senate. Daniel Akaka served as a US representative and later as a senator for 33 years. They were beloved by Hawaii voters. When Ed Case challenged Akaka for the Democratic nomination in 2006, many called it disrespectful and political suicide. In short, it was. Despite being elected to the US House in a special election in 2002, Case has lost each of his bids for governor and congress since (he’s running again in 2018). Still, Hawaii voters tend to be issue-oriented, usually around divisive political footballs. Issues like native Hawaiian sovereignty, housing and the cost of living, the environment, homelessness and education are always at the fore in Hawaii elections. Hawaii’s lack of national political currency tends to make Hawaii voters focused on issues closer to home. Many say Linda Lingle’s bungling of the Hawaii Superferry debacle, which provided cheap interisland transport that fostered the growth of many Hawaii small businesses, cost her the bid for congress. Right now, Hawaii’s hot-button issues are the astronomic cost of living and housing, Honolulu rapid transit, homelessness, and the proposed Thirty Meter Telescope on Mauna Kea on the Big Island. Of course, there are no easy answers to any of the major issues that concern Hawaii voters. Change is slow. 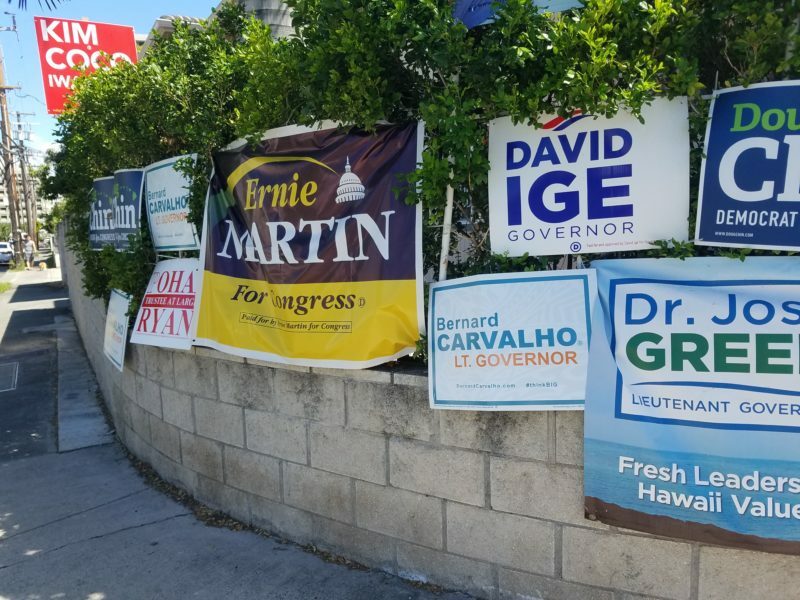 Hawaii campaign signs for multiple candidates. Outside of institutional forums for political discourse, we here in Hawaii tend to avoid politics as a topic of conversation. It’s awkward in a state so small that your political views might find you ostracized by extended family or the workplace or favorite surf spot. Political activism is largely viewed as untoward, regardless of the issue or stance. We’d prefer to just get along. That is not to say that we simply “go along.” Hawaii voters are passionate about the issues that affect them most. There’s an old joke in Hawaii that points out the Hawaii electorate’s political ambivalence: We’ve got a lot to say, but we don’t want to talk about it. We do want to listen. Residents will hang signs in their yards for both candidates in any given race, as evidenced in these photos. We’re willing to give anyone with a coherent platform a chance. We honk and wave at lei-draped candidates and their platoons of supporters at major intersections, whether we support them or not. We’re all alone out here, and ultimately, we’re in it together.